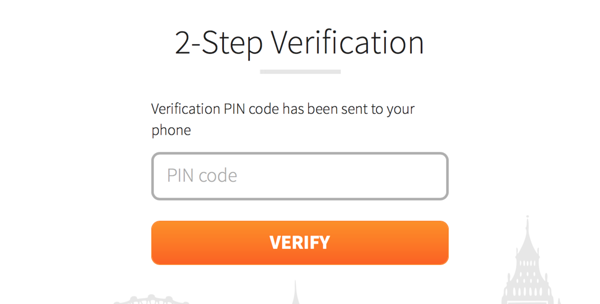 2-step verification adds one more step to login process - verifying yourself by entering PIN code which was sent to your phone. The PIN code is sent only when needed - when you switch your browser, log in after long period of time, or try to log in from another country. This makes the login process simple and extra step is only required when the level of security is at risk. The setup process takes less than a minute and it uses our own Number Verification Widget. To enable 2-step verification for your login, simply go to your Profile view and click "Enable 2-step verification" button. This redirects you to our Number Verification Widget where you can verify your phone number. First we need to verify if the phone number you want to use is correctly entered and can receive PIN codes via SMS. Next time you log in to Messente, you will receive PIN code via SMS. Just enter the PIN code and you are logged in! That's it! Your Messente account is now as secure as your online banking account!